I am always suspicious of protests because you never know what the outcome will finally be. 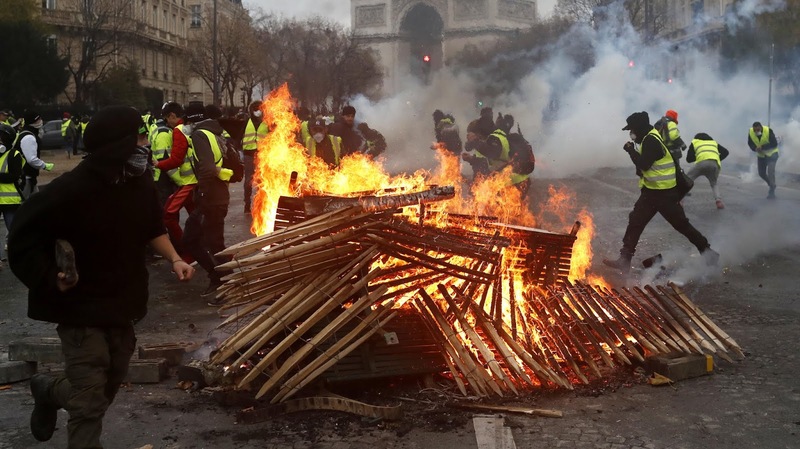 In the latest case, French President Emmanuel Macron’s government reversed course and suspended a planned fuel-tax hike that had resulted in three weeks of sometimes violent clashes. “No tax merits putting the nation in danger,” Prime Minister Edouard Philippe said in a televised address. But Yellow Vests and opposition parties said it was too little, too late. “It’s a first step that could have come weeks ago without all the rancor,” Benjamin Cauchy, an early organizer of the Yellow Vests, said on BFM TV. “But the French won’t be satisfied with just crumbs, they want the whole baguette.” He said he wanted all recent gasoline tax hikes rolled back,. However. here is the kicker, Cauchy is also calling for higher taxes on multinational corporations. In other words, the protest, at this point, is not anti-tax and anti-big government but rather a call for a shift in the point of taxation.